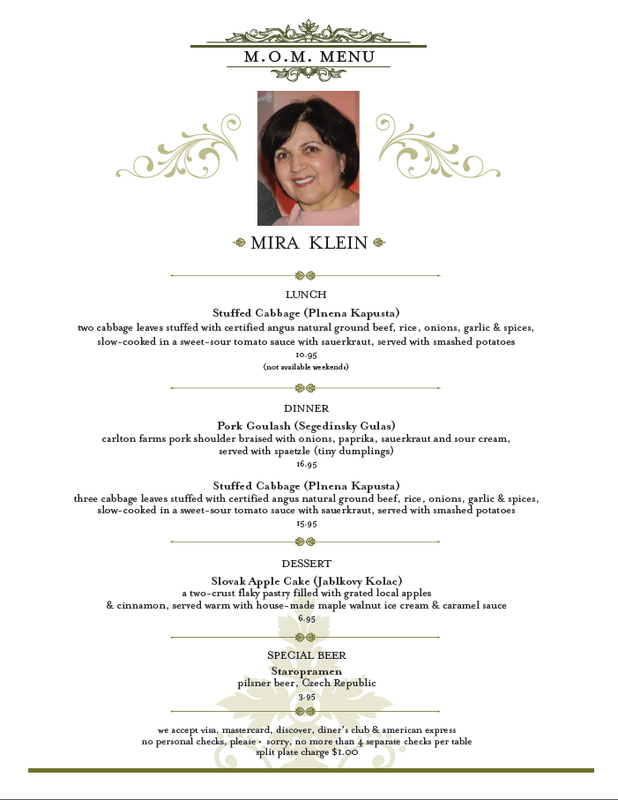 I'm so excited to announce that after weeks of collaboration with Mother's Bistro & Bar in Downtown Portland, they've launched a special Slovak menu dedicated to my mom, Mira Klein! Noticing Mother's M.O.M Program (Mother of the Month), I quickly saw this as an opportunity to feature my mom's delicious food as well as to devise a ploy to get her here to see our new home. The first wish has come true already, and I'm still waiting for the latter, which I'm hoping will materialize as well. If you're in the Portland area and want to know what true, delicious Slovak food tastes like, do stop in at Mother's during the week for lunch and dinner when they'll be featuring my mom's family recipes such as the one for stuffed cabbage, Segedinsky Goulash or her homemade apple cake she's so well known for. I'd love to know your feedback, so do let me know how you like these dishes - and make Mama happy!